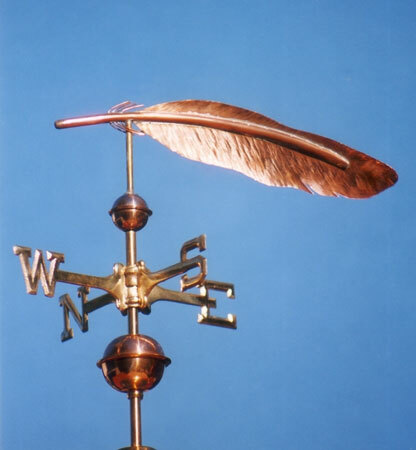 The Eagle Feather Weather Vane depicted here is one of several feather weathervanes offered here at West Coast Weather Vanes. This eagle feather was fabricated entirely out of copper. A popular option is the addition of optional gold leaf to the tip of the feather to mimic the coloration seen in certain eagle feathers. Adding optional gold leaf can be particularly effective when the weather vane sculpture piece is silhouetted against a visually competitive background such as trees, a hillside or building. The little accent of gold helps the viewer isolate the sculpture piece from the background and adds visual interest as the copper weathers a deep chocolate brown. 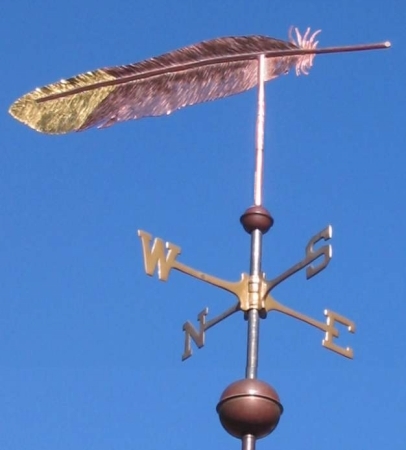 We specialize in custom weather vane designs and every piece is handcrafted to order, so if there is a particular bird feather you would like made as a sculpture piece, please contact us for additional information.